So, I will be flying with Delta (from Europe to the US, if that matters) soon and I'm trying to understand what I can take with me to my seat. The following conditions were copied from Delta's official carry-on policy. We know, you’ve probably heard it before, but just in case you need a reminder: you’re only allowed one carry-on bag and one personal item onboard at no charge. Just make sure they fit into the overhead bin or under the seat in front of you. Cram sessions are not pretty — and they slow things down. So What Exactly Is Allowed? Here's the part I don't understand. A laptop is an electronic device, it is not bag, nor is it an electronic device in a bag. 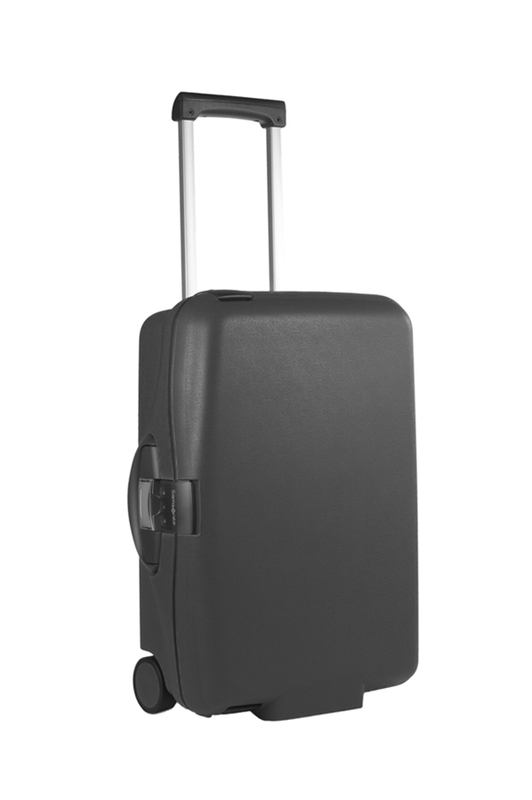 A laptop backpack with a laptop inside, according to what's above, would count as a carry-on (backpack) and one personal item (laptop), leaving no room for a proper carry-on like the one below (which, for the purpose of this question, the reader should assume it complies with the size restrictions above). I'm finding the literal interpretation ridiculous (I'm not an experienced traveler). Who takes their laptops without their laptop bags? Are people supposed to just hold on to the laptop at all times? What about other components frequently coupled with laptops like mouses, chargers and USB drives? I think a much more reasonable interpretation is that I'll be allowed a laptop within its proper backpack/bag, plus a carry-on as described above. I've reached out to Delta repeatedly, but they are not giving precise answers, always erroring on the side of ambiguity, hence this question. Can anyone clarify for me whether or not I'm allowed to take a laptop inside its proper backpack, plus a carry-on like the one in the image above? You are allocated two slots for carry on's. One slot is in the overhead bin and the other slot is under the seat in front of you. As long as your carry ons can be accommodated in your allocated slots, then you are OK. However the size of overhead bins depends on the aircraft in question, so for a smaller plane you may need to gate check your overhead bin carry on if it is too large for that particular aircraft. Also you may not have a seat in front of you, in which case both cary ons have to go in the overhead bins. Finally, cabin staff are aware of all the potential issues and will try and accommodate you as best they can. Of course if there is room (or you are first on the plane) you can put your carry ons wherever you want, and the decreased space becomes the problem of the passengers that get on after you. You're being overly literal. The regulations refer to items brought separately onto the plane. If you have a laptop inside a laptop bag inside your roller bag, that is one item: the roller bag. If you have a laptop inside a laptop bag, and also a roller bag, that is two items: the laptop bag and the roller bag. If you have a laptop outside its bag and a roller bag, that is three items: the laptop, the laptop bag and the roller bag. However, practically speaking, the staff will almost certainly allow you to take this combination on the plane. They realise that, if they object, you will just comply with the letter of the policy by putting your laptop inside its bag until you're on the plane, and then taking it out again. It would be pointless to make you do that. The easiest way to think is "one carry-on bag and one personal item" so two items only. If you have a laptop sleeve, a backpack, and a roller bag. That's three. Plan for two items and you'll be safe. I just flew on Delta last week with my laptop in a laptop bag. The laptop bag fit under the seat in front of me and I had no issues. Remember that TSA will still require you to remove the laptop and separate it from the bag when going through security. You always have the space under the seat in front of you (except bulkheads, policies vary some there). If it fits, it ships flies. Most laptop bags will fit here. Not the answer you're looking for? Browse other questions tagged air-travel luggage hand-luggage delta-air-lines or ask your own question.